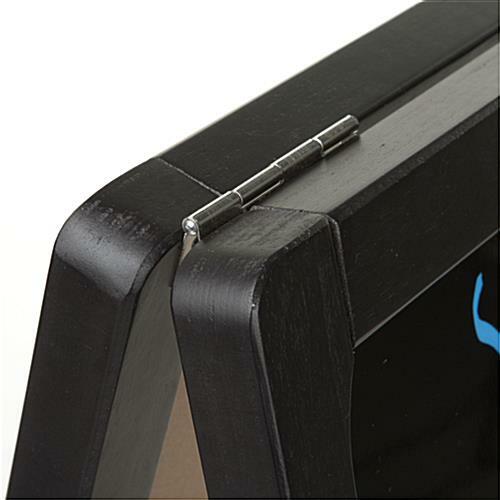 This A-Frame Board Is Always In-Stock for Fast Shipping. Many Different Sizes and Designs Available Online! 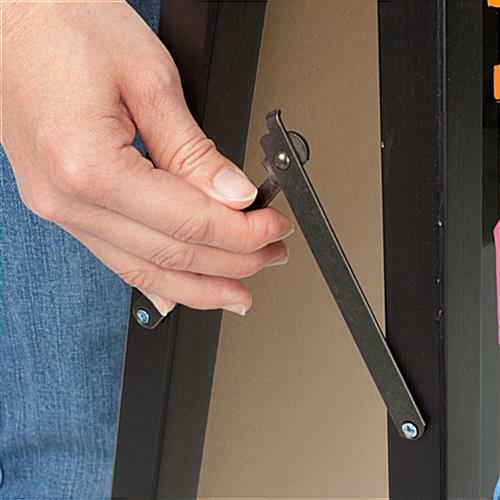 Order This A-Frame Board Online for More Savings! 24-3/4"w x 38-3/4"h x 20-1/4"d pavement signage is foldable for easy storage and mobility with built-in side hinges. 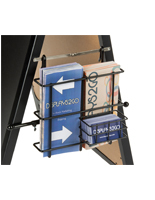 Dual-sided for displaying messages in two directions. 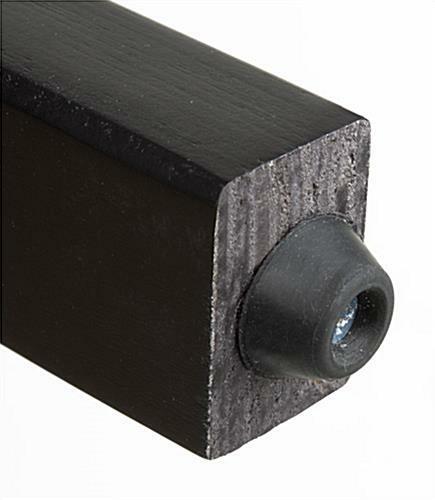 Black wood frame complements easily to any business settings. 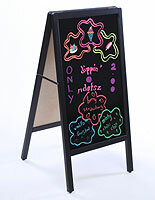 22"w x 28"h glossy blackboard surface designed for use with wet-erase and liquid chalk markers – not for regular dry chalk. This a-frame board is sure to draw the attention of those passing by your facilities. The blackboard sign is two-sided to ensure maximum exposure. Each side has a 22" x 28" writable area, providing users with amply of space to write messages. Be creative and generate your own alluring message board! 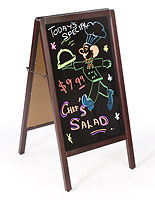 This blackboard sign that is double-sided ensures your advertisement will get noticed. Customers coming from either direction will be able to view the message. 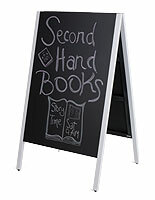 This blackboard sign that has shiny board is meant for use with wet-erase and liquid chalk markers only. Messages written using the wet-erase and liquid chalk markers can be easily wiped off using a damp or wet cloth. 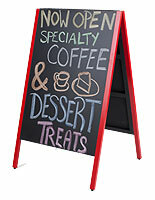 As a result, for location needing to change their signage often, this a-frame blackboard sign is the perfect solution! 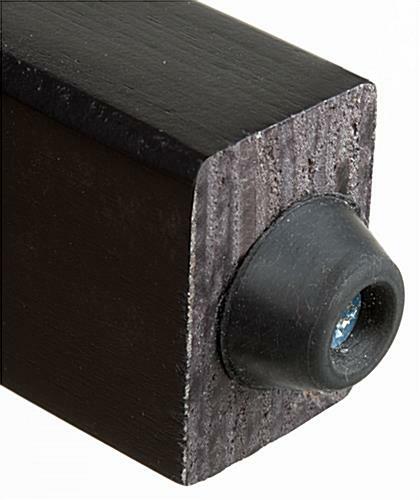 The glossy board is not intended to use with regular dry chalks. There will be no writing tool provided with the unit. However, this site does sell the wet-erase and liquid chalk markers separately (see related products on the right hand corner for more options). 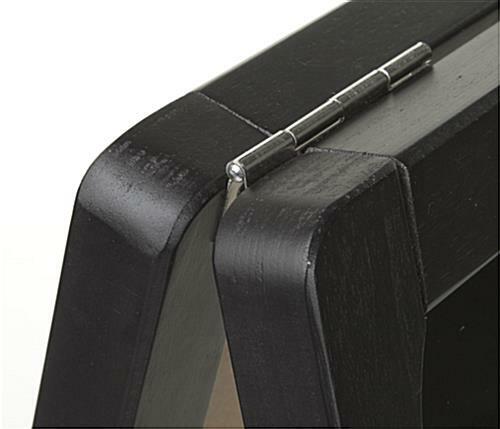 The business write-on board, a-frame blackboard has side hinges on either side. 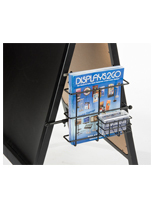 When not in-use the unit can be folded together for easy storage. 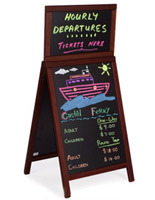 This blackboard sign that has black wood frame is designed for indoor use only. However, users can also place this sidewalk sign outdoor but under fair weather conditions. The sidewalk display, blackboard sign has a black finish which makes the unit coordinates easily with to any business locations. 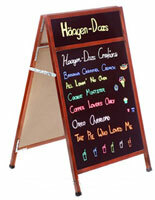 Businesses can utilize this a-frame to show promotional signage, menu listings or important announcements. 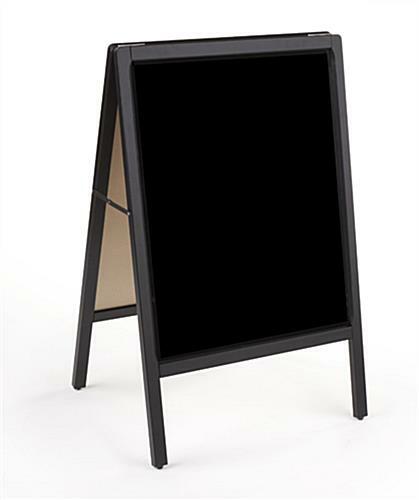 This double-sided blackboard sign, such as sidewalk display is also a great advertising tool for use in places like cafes and store fronts to communicate "Daily Specials", "Clearance" or "Ongoing Events". An indoor a-frame, like the one seen here visibly conveys your message and helps to lure potential customers into the establishments. Besides of using it as advertising purposes, this sidewalk display also makes a great instructive tool. Schools and classrooms can use this a-frame board to teach school children. This sidewalk display is sold in other sizes and designs as well. Find the best size a-frame for your establishment and use it to get your message across! 24.8" x 38.8" x 20.3"